The Deputy Minister of Culture, Mr. Rumen Dimitrov, confirmed that the procedure for giving national protected status to the Buzludzha Monument in Bulgaria will be accelerated. This statement was made during the mission to Buzludzha undertaken from 26-28 September by European experts from Europa Nostra, the leading heritage organisation in Europe, and the European Investment Bank Institute (EIBI). The building was listed by Europa Nostra and the EIBI among the 7 Most Endangered heritage sites in Europe in 2018. The nomination was made by the Buzludzha Project Foundation, represented by the architect Ms. Dora Ivanova, who has been leading the initiative for the preservation of the monument since 2015. The key findings and recommendations of the mission will be published in a report by the end of 2018. 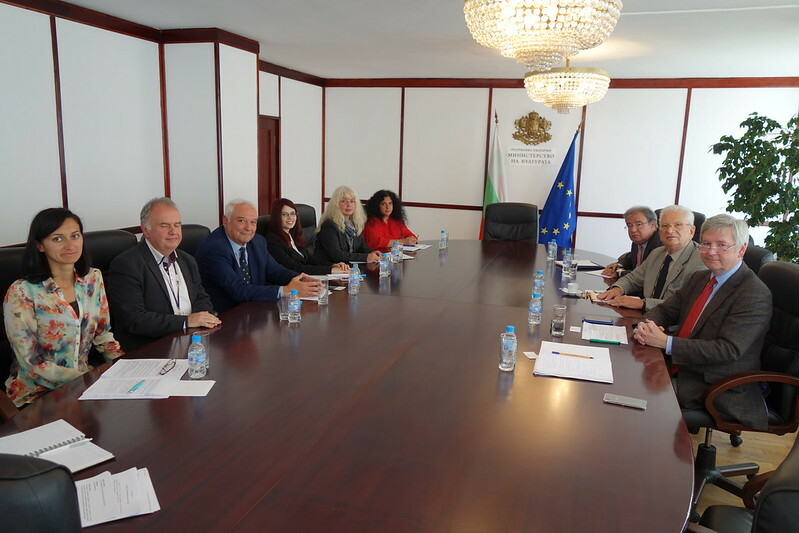 The European delegation of specialists in cultural heritage and finance had productive meetings with national and local authorities – namely the Deputy Prime Minister, Mr. Valeri Simeonov, the Deputy Minister of Culture, Mr. Rumen Dimitrov, and the Regional Governor of Stara Zagora, Ms. Gergana Mikova. They also met the architect of the monument, Mr. Georgi Stoilov. The stakeholders promised their full co-operation in the preservation of the monument. During the inspection of the monument the experts were amazed by its striking and outstanding modern architecture which is of European value and were shocked by its derelict condition. The delegates were impressed by the creativity and the skills used to create the monument, namely the craftsmanship for the mosaics and marble, and its beautiful natural setting. The experts acknowledged that Buzludzha is part of the collective memory of Bulgaria and Europe and therefore its preservation is of European significance. The experts’ opinion is that the monument should be preserved and used for cultural and educational activities and that it should become a place for gathering and events related to history and art. The European delegates recommend urgent action to stop the deterioration with proposed funding through the European Cohesion Funds. A pre-condition for this funding is that the monument has national protected status, which should be obtained soon. Parallel to these procedures the preparation work, such as building scanning and structural surveys, must be done. The Regional Governor, Mrs. Mikova, announced that the University of Architecture, Civil Engineering and Geodesy will carry out the needed actions on a voluntary basis. The Buzludzha Monument is a masterpiece of architecture, engineering and art. The unique structure was built in 1981 as the House-Monument of the Bulgarian Communist Party. The structure was used for just 8 years until the end of the Communist regime in Bulgaria in 1989. Soon afterwards, the Buzludzha Monument was abandoned and has since been victim to thefts, vandalism and severe weather conditions. The building still attracts attention thanks to its gravity-defying architecture and its colourful mosaics, which cover 1,000m² of the building’s interior. A total of 70,000 tons of concrete, 3,000 tons of reinforced steel and 40 tons of gilded glass were used. Some 6,000 people laboured on the construction work, which was financed by donations from the entire Bulgarian nation. Today despite efforts to preserve the building, it is still crumbling and highly endangered. However, its recovery is still possible.